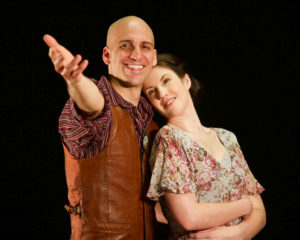 I saw Yellow Tree Theatre's production of The Rainmaker a few years ago and absolutely loved it. Last fall, Second Fiddle Productions gave me a taste of the musical in their staged reading, and I'm even more charmed by it now seeing a fully staged production. The story of the musical is pretty similar to the play (The Rainmaker playwright Robert Nash wrote the book), although there's more lightness and humor than the beautifully sad play I remember, but it is a musical. The story is a bit antiquated, with the family desperately trying to "marry off" Lizzie, but if you can look past that, it's more about her wanting to be seen and loved and appreciated, which is what we all want. Starbuck gives that to her, as well as a belief that she deserves those things. * I wish the ending weren't quite so pat, but it's refreshing to see a story in which a woman doesn't have to change who she is, to lie and flirt to "get a man the way he needs to be got," but rather to see the men appreciate her for who she is. The score is lovely, romantic, and funny, with a variety of musical styles. After this second experience with the music I decided to download the cast recording (2007 revival with Audra McDonald, John Cullum, and Steve Kazee, natch). TRP's sparse four-piece orchestra (keyboard, percussion, trumpet, and clarinet) led by music director Angela May suits the intimate space, and the sound balance is great even with the challenges of singing in the round. The strong cast is led by Emily Jabas, natural and likable as the no-nonsense serious-talking Lizzie. She has wonderful chemistry with Rodolfo Nieto as her Starbuck, who possesses a bartione voice so thrilling and powerful I half expected it to be raining when I left the theater. Michael Dufault as Lizzie's father and Jared Mogen and Andrew Newman as her brothers form a believable family unit, and Michael Postle's Sheriff File is a legitimate romantic rival. The large ensemble fills out the town and makes the chorus numbers sound lovely and rich, performing Shannon Roberg's charming folksy choreography well. Set designers Scott Gilbert and Corinna Troth utilize a quilt pattern theme in inlaid wood around the arena, with very little in the way of furniture or set pieces to crowd the open space, just a few rustic benches and platforms (including a couple of benches that ingeniously convert to picnic tables). Carolann Winther's costumes look authentically period and Western, including cowboy boots and hats. The townspeople are dressed in simple but pleasant attire, against which the mysterious Starbuck's flashier clothes (a leather vest!) are contrasted. 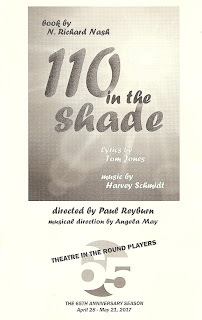 The lovely 110 in the Shade continues through May 21 at Theatre in the Round. *Some text borrowed from what I wrote about about Second Fiddle's staged reading last fall.